May 17, 1986 and I’m at the RDS Stadium in Dublin for Self Aid, Ireland’s response to Live Aid. Many of the big acts are present, including U2, Van Morrison, Elvis Costello and The Pogues. There is talk about the endemic of unemployment and the evening will end in a woozy farewell to Phil Lynott who had died in January. But the moment I recall most vividly is when Christy Moore performed ‘Back Home In Derry’. It seemed like everyone was singing that chorus and Christy had the presence to encourage the thousands of voices as they lifted into the spring evening. It was yet another song about Irish rebels being deported to Australia. The tune was borrowed from Gordon Lightfoot but the inescapable truth was that the lyric had been written by Bobby Sands, IRA hunger striker. There was a really peculiar tone in the stadium. It was not about rage or bitterness. It was something to do with sorrow and also a communal reckoning – a chance for people to reconsider those intense days of 1981. No doubt there were extreme sentiments about the hunger strikes elsewhere, but on that evening, people had elected to look at it in a different way. It was a rethink after five years, aided by a bit of physical distance from Belfast. Such is the trajectory of a myth. 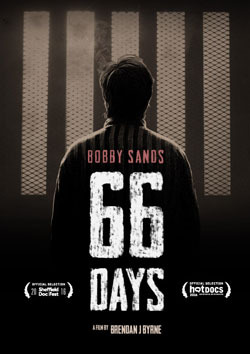 The 66 Days film goes back to the Bobby Sands story after 35 years, prepared for another perspective. There is archive and fresh remembrances, input from comrades, a prison officer, a medical expert, diplomats and various stripes of political analysis. The guys tell their prison stories, Norman Tebbit puts out the Conservative line, there are a series of reconstructions while the Bobby Sands diaries provide a narrative spine. My chief recollection of 1981 was an awful, constricted feeling about the ribcage. It felt like an effort to manage fresh air. Hindsight suggests that it was inevitable, a grinding installment. But at the time it was difficult to process the distress and fanaticism, brinkmanship, injury and seeming lack of intervention. Back then, I was a year into college in Jordanstown, connecting to a great variety of people. I felt socially enriched. I was also informed by punk and the belief that there was a shared, alternative space, without the bullets and the bullhorns. Much of this was challenged across the year. The Hunger Strikes was a convolution and 66 Days looks at some of the possible outcomes. There is talk of martyr traditions and even the “artistry” of Sands. Danny Morrison sets out the theory that a winning side in a conflict has a greater capacity for enduring, not afflicting. We review the posturings of Margaret Thatcher and we recall the IRA killing of Joanne Mathers, collecting census forms at a time when the organisation was developing its own political ambitions. The journalist Fintan O’Toole teases out a few riffs, positing that Sands had “a Victorian sense of duty” and that his death actually made the armed struggle redundant. Dissident voices would surely contest that theory and significantly, there is no direct commentary from the Bobby Sands Estate. Indeed we hear very little from a female viewpoint and the surviving images of the man in question are blurred, overexposed, lost in the grain and the poor resolution of those cheap, 110 format cameras. The iconic image of Sands was taken during a home brew session at Long Kesh. He has a centre parting and shoulder length hair, apparently modeled on Rod Stewart. He wears a gull wing shirt and red jumper that’s based on the American letterman style. Thousands of these were sold out of the John Frazer shops on North Street – suppliers to Belfast corner boys in the mid Seventies. By 1981 this look was long gone. But this picture endures, out of time. Director Brendan J Byrne has engaged with this received vision. He sees fit to include the wrecked bodies from IRA bombings. He takes us back to West Belfast and its severe aspects. Oddly, the new Gerry Adams content is low key. Peter Robinson has an archive cameo part, the mouth barely moving, the words ejected like nails. I watched this in a quiet Belfast cinema, a few days after the high profile premiere. I thought the soundtrack was often bothersome and the slow motion sequences were unnecessary. The diary sequence about the curlew was overcooked. As expected, there was a whiplash of trauma and anxiety. But I also felt invited to chose from the many nuances and contradictions that this 2016 version had presented. That’s what I supposed was also on the faces of the viewers as they exited quietly. Much to consider. A timely piece of work. File under Special Category.